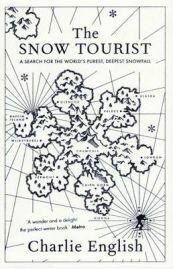 In his book “The Snow Tourist”, journalist Charlie English presents a series of separate but related travelogues looking at snow from a number of interesting perspectives. Subtitled “A Search for the World’s Purest, Deepest Snowfall” the book covers a variety of aspects such as how an American enthusiast discovered that no two snowflakes are alike, how Inuits in North America use snow in their everyday lives, and how one Austrian man developed skiing as we know it today. As well as being a compelling piece of writing in its own right, this book is a touching (but not sentimental) work as English explains how his fascination with snow first began, describing the death of his father, a keen competitive skier, and his subsequent family skiing holidays with his mother and brother. To assuage his guilt at leaving his own wife and children at home while he researches the severe snowstorms that have affected the eastern seaboard of the United States, English flies this family out to join him in New York, only for that city to grind to a standstill just as they are due to fly home. Charlie’s wife does not share his passion for snow! This book has everything – culture, history, sport, science – and each aspect that English deals with is given enough depth so make it interesting but accessible by the layman. In one chapter he whisks his long-suffering wife off to Vienna on the pretext of a romantic cultural weekend break away from the snow but his first port of call is the Kunsthistorisches Museum where he makes a beeline for, perhaps the most famous depictions of a snow scene, Pieter Breughel the Elder’s “The hunters in the Snow”. In another he visits the place reputed to be the snowiest in the world just north of Seattle, quite remarkably he tells us that just on the other side of the mountains is the city of Spokane which is one of the hottest places in the States! Here he uses the ongoing battle between two towns over which gets the most snowfall, to illustrate the difficulties inherent in accurately measuring snowfall. I am incredibly dim when it comes to things metrological (I once remarked how funny it was that it is always very sunny once one gets above the clouds, something my OH has never let me live down) but the scientific aspects of the book are explained brilliantly not just within the chapters as appropriate but in a quirky little miscellany at the end of the book. There’s just enough science to explain things to some one like me, and a comprehensive bibliography for those who want to read up in more detail. The miscellany also includes a selection of list of things like most avalanches victims by country, ten weird snow falls, a pictorial guide to common snowflake shapes and a pictorial guide to building an igloo (I must admit to not yet having tried this!). “The Snow Tourist” is exceptionally well researched and includes meetings with experts and excerpts from diaries and newspaper articles from the times of significant periods of heavy snows. Most notable is a section on the American author Jack London which describes how the gold prospectors risked life and limb battling with the elements in order to try to make their fortunes. I read London’s “The Call of the Wild” almost thirty years ago at school and Charlie English has certainly inspired me to re-read it, which, when I do so, will have a whole new significance for me. “The Snow Tourist” is a terrific read which will be enjoyed by anyone who gets excited by the first flakes of snow falling. Part travelogue, part history, part science, it’s a well-considered account of one man’s obsession that simultaneously educates, entertains and enlightens. Highly recommended! 2 Comments on "The Snow Tourist"